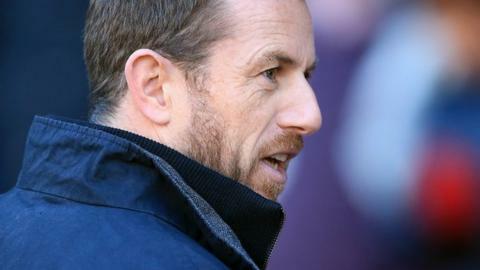 Birmingham City manager Gary Rowett has always loved the FA Cup - even if it if has not always loved him. As Burton Albion boss, he twice took the Brewers to the third round - but he suffered Cup upsets as a player, most memorably for Leicester against Wycombe Wanderers in the 2001 quarter-finals. And the boot could be on the other foot again when Rowett takes Blues to non-league Blyth Spartans on Saturday. "I'm well aware there are Cup upsets," 40-year-old Rowett told BBC WM 95.6. Birmingham, 14th in the Championship, are five rungs above Blyth Spartans, currently 16th in the Northern Premier League, in the English football pyramid. Blyth Spartans reached the fifth round in 1978, when they beat Chesterfield, Burscough, Enfield and Stoke City before losing to Wrexham in a replay. Blyth gained revenge when they played Wrexham again later that season in the Debenhams Cup, an end-of-season competition created for the two lower division/non-league sides who went furthest in that season's FA Cup, winning over two legs. Blyth still hold the trophy, as, after just two seasons (Chester were the first winners in 1977), it was never competed for again. "Everyone likes that nice story of a team like Blyth who have done well to get this far. It all adds to the magic of the Cup." Rowett's words of caution to his confident Blues side at Croft Park will concentrate on his own worst experience. Right-back Rowett was a member of Peter Taylor's Leicester team from the Premier League, denied a place in the 2001 semi-finals by Wycombe, from two levels below them. Roy Essandoh, the scorer of Wycombe's celebrated winning goal, provided one of the more colourful chapters in the FA Cup's history, having been at the club less than a week after his availability was spotted by Wycombe manager Lawrie Sanchez in a small snippet of news on Ceefax. "This is what the competition's about," adds Rowett. "I remember as a kid dreaming of scoring the winning goal in the Cup final. "Unfortunately, my dream did not come true, particularly after being knocked out by Wycombe in the quarter-finals when Roy Essandoh, the man from teletext, scored the winning goal." Rowett and his Blues team are well prepared, having watched Northern Premier League side Blyth's last-gasp second round win over Hartlepool on TV at their team hotel, the night before their Championship defeat at Blackpool in early December. "You know they're going to lift their game massively against a team like us. It's a huge game for them," said Rowett. "But often the downfall of a bigger club is taking the opponents lightly. And we'll guard against those sort of complacencies. "We had quite a lot of cup success at Burton. We knocked Wigan Athletic and QPR out of the League Cup earlier this season. "It's about matching the effort and will to win of the team below you and making your quality count." Birmingham City manager Gary Rowett was talking to BBC WM's Richard Wilford.